The AP Computer Science A exam often asks students to resize an array, typically by removing some stuff from the array, stuff that doesn’t meet some kind of criteria. 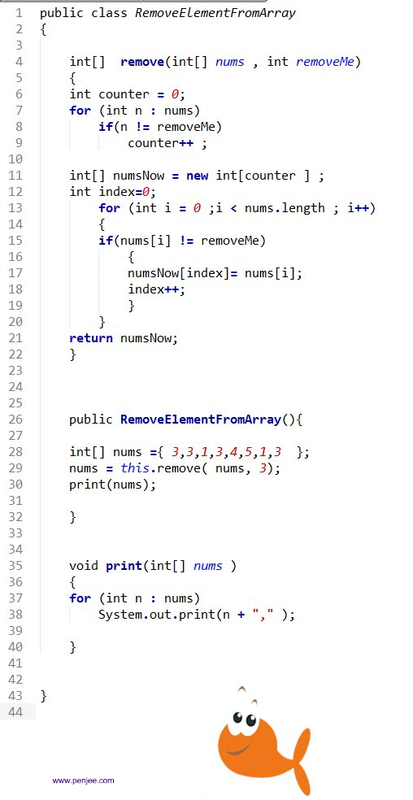 I have already gone over an AP styled question here on this, but let’s now look at some more intuitive code for removing an element from a Java array (download Code here ). Typically, in the Part II questions, the array might store objects like the TrimSilence question from 2011 question 1 on the Sound class. But I think the easiest way to try to understand this concept is by looking at a series of ints and trying to remove a specific int like the code pictured above.